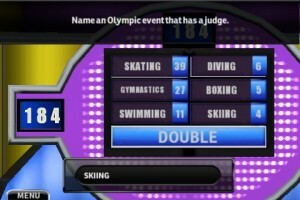 Family Feud for the iPad [iTunes link] is a large screen optimized rendition of the long popular game show of the same name. The point of the game is earn points and money to edge away against various other families as they compete to reveal the answers to questions that were most commonly provided by 100 survey takers. Family Feud kicks off with the ability to customize the name and basic looks of your character. From there you step into the arena and head straight into a face off at the buzzer with a member of the competing (computerized) family. Just like in the real game, the family who provides the best answer gets to choose between playing or leaving the guessing to the opposing family. If you guess wrong three times, the other family gets the opportunity to steal the points. 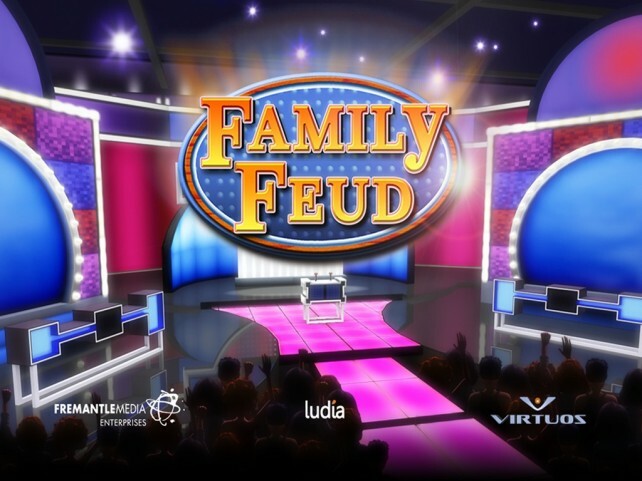 The game advances until one family gets 300 points, and then advances to a quick fire bonus round where you’re given the opportunity to win $20,000 virtual dollars. The single player version of the game sets you against twelve different families and the first few provide some ridiculous answers so they’re really easy to beat, but near the end you’re sometimes caught by tough competition and unexpected (but entertaining) survey answers. Playing on the iPad is quite smooth. The graphics are great, the music is spot on, just like the show, and features like the word finishing tool that helps automatically generate words as you start to type make it easy to play Family Feud on the iPad even if you haven’t mastered the on screen keyboard. When the clock runs below ten seconds and the ticker sounds become more incessant, this feature is clutch. As you progress, options and accessories are added to your wardrobe so that in between games you can change clothes. This makes for a fun interactive addition to the game, as do the background stories of each of the opponent families who step up to the plate to challenge you in the game show. Playing Family Feud on the iPad is a blast, especially if you have a group to take advantage of the multiplayer mode where a competitor takes over the role of the computerized opponent, but there are a couple things I wish I could change. 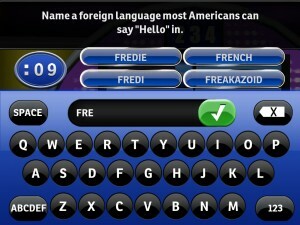 For starters, the computerized questions repeat sometimes and this game is a near replica of Family Feud on the iPhone. Even the most fanatic of the Family Feud fans should stick to either one version or the other in this case. Also, unfortunately you have to sit through every single transition period in the game. For example, rather than having the option to tap through to skip the screenshot pans and host verbalizing each specific point, you have to go at the pace of the host’s voice. This isn’t an app breaker by any means, but it would be nice to have some control over the speed at which the game is played. All said and done, Family Feud for the iPad is a fun, highly entertaining game. The game show style graphics are great and it’s nice to know that the survey results in your game are actually real. If you’ve always dreamt of getting on television for this game, here’s your chance to play on the iPad. It’s everything you’d expect and more. 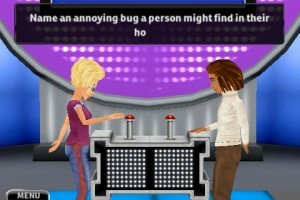 Bottom Line: Family Feud HD is a great rendition of the popular game show. It’s entertaining, easy to play, and much like stepping into the actual game show except for the fact that you’ll start to see the same questions if you play too much.